(b) the measures taken to remove disparity in payment of wages? 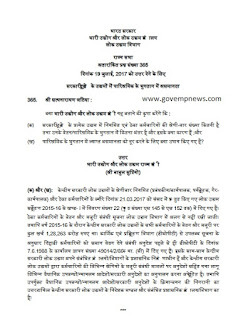 (a) and (b): The details of category-wise regular (Managerial / Executives, Supervisory, non-executives) and contractual employees of Central Public Sector Enterprise (CPSEs) are given in Statement No. 22 (from Page No. S-145 to S-152) in Volume-I of Public Enterprises Survey 2015-16 that was laid in the Parliament on 21.03.2017. The information of salary & wages of the contractual employees is not maintained separately in Department of Public Enterprises. However, the total quantum of expenditure on salary & wages of all employees of CPSEs during the year 2015-16 was Rs. 1,28,263 crore. As per information available from Department of Personnel & Training (DoPT), the instructions regarding equal pay admissible to casual workers already exists in terms of DoPT O.M.. No. 49014/2/86 Estt. (c) dated 07.06.1988. 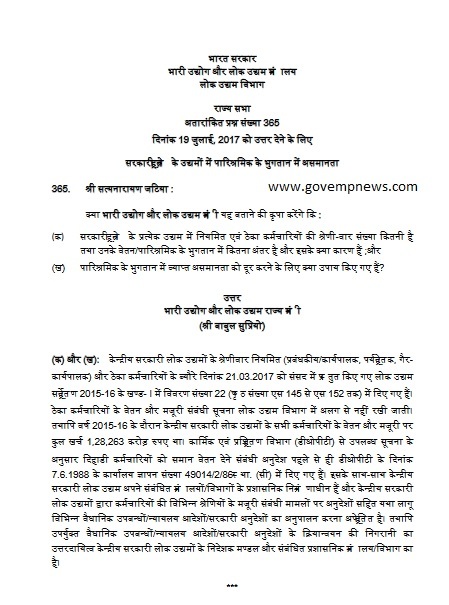 Further, CPSEs are under the administrative control of their respective Ministries / Departments and CPSEs are required to follow the various statutory Provisions / Court orders / Government instructions including instructions on wage related issues of various categories of employees, wherever applicable. However, the responsibility to monitor the implementation of above said statutory Provisions / Court orders / Government instructions vests with the Board of CPSEs and the concerned administrative Ministry / Department.